"Maamme" or "Vårt land" is Finland's national anthem. The music was composed by the German immigrant Fredrik Pacius, with words by Johan Ludvig Runeberg, and with this music it was performed for the first time on 13 May 1848. Originally it was written for the 500th anniversary of Porvoo and for that occasion it was Runeberg himself who wrote the music. The poem has been influenced by the "Szózat" (Appeal) of Mihály Vörösmarty, both in style and content. "My Country, 'Tis of Thee", also known as "America", is an American patriotic song, whose lyrics were written by Samuel Francis Smith. The melody used is the same as that of the national anthem of the United Kingdom, "God Save the Queen", arranged by Thomas Arne. The song served as one of the de facto national anthems of the United States before the adoption of "The Star-Spangled Banner" as the official U.S. national anthem in 1931. The "Virgin Islands March" is a U.S. patriotic song which is considered to be the territorial anthem of the United States Virgin Islands. "Aegukga", often translated as "The Patriotic Song", is the national anthem of South Korea. It was adopted in 1948, the year the country was founded. Its music was composed in the 1930s and its lyrics date back to the 1890s. 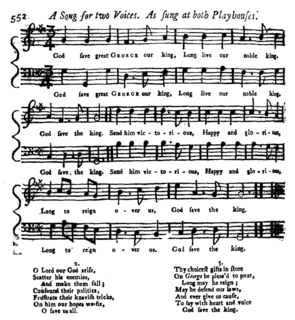 The lyrics of "Aegukga" were originally set to the music of the Scottish song "Auld Lang Syne" before Ahn Eak-tai composed a unique melody specifically for it in 1935. Before the founding of South Korea, the song's lyrics, set to the music of "Auld Lang Syne", was sung, as well as during Korea under Japanese rule by dissidents. The version set to the melody composed by Ahn Eak-tai was adopted as the national anthem of the Korean exile government, which existed during Korea's occupation by Japan from the early 1910s to the mid-1940s. Peter Dodds McCormick, a Scottish-born schoolteacher, was the composer of the Australian national anthem "Advance Australia Fair". 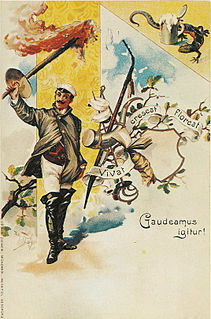 "De Brevitate Vitae", more commonly known as "Gaudeamus Igitur" or just "Gaudeamus", is a popular academic commercium song in many European countries, mainly sung or performed at university and high-school graduation ceremonies. Despite its use as a formal graduation hymn, it is a jocular, light-hearted composition that pokes fun at university life. The song is thought to originate in a Latin manuscript from 1287. It is in the tradition of carpe diem with its exhortations to enjoy life. It was known as a beer-drinking song in many early universities and is the official song of many schools, colleges, universities, institutions, student societies and is the official anthem of the International University Sports Federation. "Hail, Columbia" is an American patriotic song that is the ceremonial entrance march of the Vice President of the United States. The Salve Regina, also known as the Hail Holy Queen, is a Marian hymn and one of four Marian antiphons sung at different seasons within the Christian liturgical calendar of the Catholic Church. The Salve Regina is traditionally sung at Compline in the time from the Saturday before Trinity Sunday until the Friday before the first Sunday of Advent. The Hail Holy Queen is also the final prayer of the Rosary. Majulah Singapura is the national anthem of Singapore. Composed by Zubir Said in 1958 as a theme song for official functions of the City Council of Singapore, the song was selected in 1959 as the island's anthem when it attained self-government. Upon full independence in 1965, Majulah Singapura was formally adopted as Singapore's national anthem. By law, the anthem must be sung with Malay lyrics, but there are authorised translations of the lyrics of the anthem in Singapore's three other official languages: English, Mandarin and Tamil. "The Hymn of Joy" is a poem written by Henry van Dyke in 1907 with the intention of musically setting it to the famous "Ode to Joy" melody of the final movement of Ludwig van Beethoven's final symphony, Symphony No. 9. This is a list of Polish national and patriotic songs. The Red Flag is a socialist song, emphasising the sacrifices and solidarity of the international labour movement. It is the anthem of the British Labour Party, Irish nationalist Social Democratic and Labour Party, and Irish Labour Party. The song is traditionally sung at the close of each party's national conference.